If you have ever grown zucchini, you know it can take over a garden. 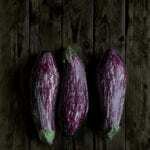 Its vining habit combined with heavy fruit also lends it a tendency towards leaning zucchini plants. 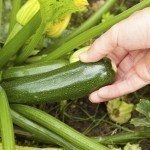 So what can you do about floppy zucchini plants? Read on to learn more. Help, My Zucchini Plants are Falling Over! First of all, don’t panic. Many of us who have grown zucchini have experienced the exact same thing. Sometimes zucchini plants fall over from the outset. 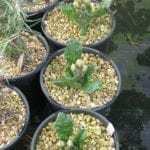 For example, if you start your seeds indoors when there isn’t a sufficient light source, the little seedlings tend to stretch to reach the light and will often topple over. In this instance, you can try to mound soil around the base of the seedlings to give them extra support. 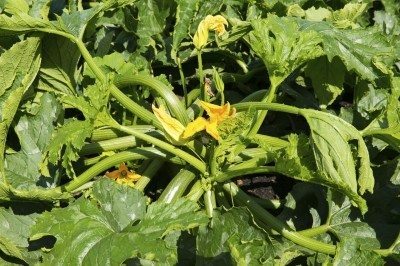 If you are well past the seedling stage and have adult zucchini plants falling over, it’s never too late to try to stake them. You can use garden stakes, or anything lying around, along with some twine, horticultural tape or old pantyhose; use your imagination. At this time, you can also remove any leaves below the fruit, which will help identify ready fruit before it becomes zucchini-zilla. Some people also mound dirt around them if their zucchini plant falls over. This may be a good thing and allow the plant to sprout more roots, which will give it more support. If you have actual floppy zucchini plants, they might just need some water. Cucurbits, of which zucchini are members, have deep roots, so water slowly with one inch of water per week and allow it to soak down 6-8 inches deep. At any rate, take this is a gardening learning lesson. And if you go ahead and stake them or cage them before they get too large next year, I don’t see leaning zucchini plants in your future because you will be ready.